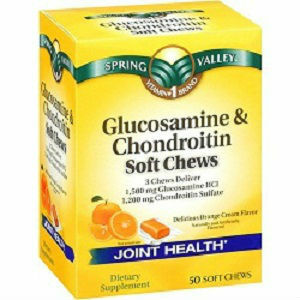 What makes this product different from other joint health supplements is the fact that it comes as soft chews. For people who have problem digesting pills, the delivery format is much appreciated, and Spring Valley Glucosamine Chondroitin Orange Cream flavor Dietary Supplement has plenty of positive reviews from users. While it combines only two strong ingredients with clinical evidence to work for joint pains, this is a reliable product, seeing how many people would recommend it to others for their problems. Let’s see together what Spring Valley Glucosamine Chondroitin Orange Cream flavor Dietary Supplement is made of, and how it can help relieving pain in your joints. The label mentions that there is no yeast, milk or soy included with their recipe, but makes no reference whether shellfish is used or not. In case you have allergies, you should contact the company for more info, or simply choose another product. It is a positive aspect that the product contains both glucosamine and chondroitin, but it lacks important ingredients like MSM and hyaluronic acid. According to the label, you need to use three soft chews daily to see notable effects. At 10.88USD for a bottle with 50 soft chews, Spring Valley Glucosamine Chondroitin Orange Cream flavor Dietary Supplement is more than decently priced, but be aware that you must purchase more bottles to last for a longer time. There is no clear guarantee offered on the websites selling this product. Since Spring Valley Glucosamine Chondroitin Orange Cream flavor Dietary Supplement is sold through resellers, you may have to depend on their refund policies. Since it enjoys so many positive reviews, Spring Valley Glucosamine Chondroitin Orange Cream flavor Dietary Supplement sounds like a great product. Many people appreciate the pleasant flavor and say that they have experienced important improvements in their joint pains. It contains the most reliable ingredients for joint pains, glucosamine and chondroitin, but we would have loved to see more active compounds included in the formula. Mark Stevens	reviewed Spring Valley Glucosamine Chondroitin	on August 6th	 and gave it a rating of 2.5.